Belarus is a European country—pop. 9.85m—that most folks would have difficulty finding on a map. (It’s on the western border of Russia.) It’s not a place you’d expect to find a top-flight custom motorcycle designer, but a Belarusian machine won the Best Streetfighter trophy at the last Custombike show in Germany. And that same bike has just won the Best International Builder award at the Verona expo in Italy. The bike is called DUster and it’s from YSC, a name to look out for in the future. 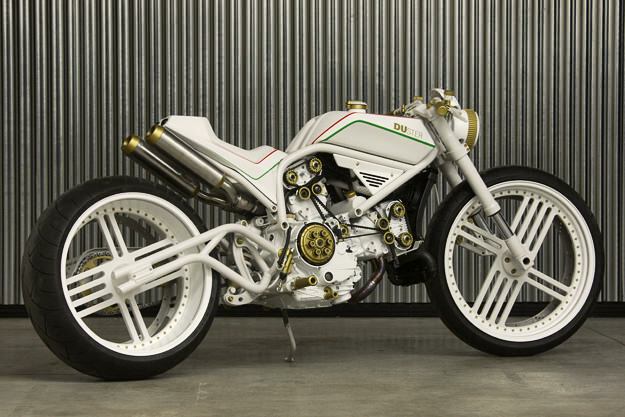 Owner Yuri Shif has created a very original look—baroque is the word that springs to my mind—using a Ducati Monster engine and transmission. The frame, bodywork and swingarm suspension are Shif’s own creations and the front fork is a modified Showa item. Custom perimeter brakes give the wheels a clean profile. It’s to Shif’s huge credit that he has achieved success in a country without a mainstream custom culture, and without a huge network of parts designers and suppliers. DUster will no doubt be heading Stateside soon: what kind of reception do you think the radical styling will get? Check the Bike EXIF Facebook page for more just-released studio shots of DUster.